Ibanez TS808HW Hand-Wired Tube Screamer Review – Best Overdrive Pedal? The Ibanez TS-808 Tube Screamer is one of the all-time classic overdrive pedals, most notably used by legendary blues guitarist, Stevie Ray Vaughan, to achieve his signature sound. Three knobs – Level, Tone, & Overdrive – and that all-important JRC4558D chip form the basis for the classic mid-boosted tones the Tube Screamer is known for. 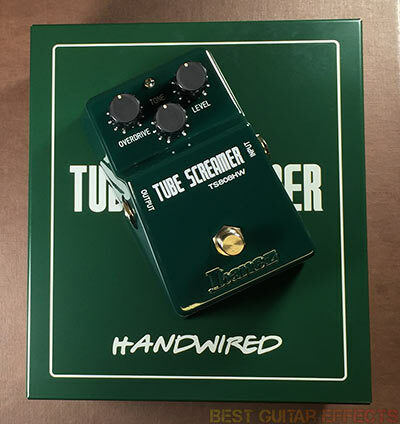 The Ibanez Tube Screamer TS808HW returns to the hand-wired craftsmanship of the original pedals with a serious upgrade to the quality of components and wiring. Is this the best TS-808 overdrive pedal available? 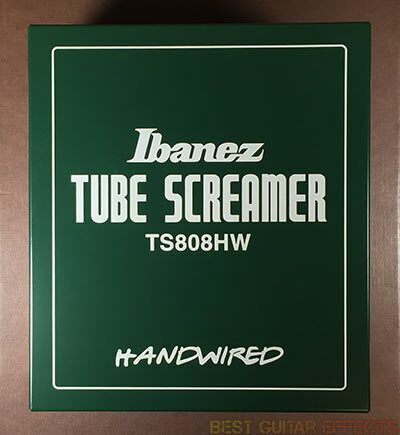 You’ll find out in our Ibanez TS808HW Hand-Wired Tube Screamer review. Powered by one 9 Volt Battery or external AC Adapter AC509 (sold separately). Modern power supply adapter included (1/8” (3.5mm) to 2.1mm barrel plug). Visit Ibanez for more info about the TS808HW. There’s something about the vibe of the TS808HW that really screams premium tone. It’s more than just appearances. The new heavy, rugged enclosure and collector’s metal box contains something within that’s really special. All the talk of hand-wiring, original JRC4558D chips, and premium components would mean nothing if the tone wasn’t there. Thankfully, it is. The Ibanez TS808HW is truly a premium, boutique grade overdrive pedal and comes closest to capturing that original Tube Screamer TS-808 sound than nearly any other pedal. Now when I say the TS808HW is closest to the original Tube Screamer sound, there are a few things that need to be understood. Those early Tube Screamers everyone’s chasing around on eBay for exorbitant prices often have slight tonal variances. They may sometimes sound as different from each other as the TS808HW sounds to any of them. Anyone trying to put one of those pedals on a pedestal, as great as they may be, needs to understand that there are just certain inconsistencies that make it difficult to create the definitive Ibanez TS808HW vs original TS808 Tube Screamer comparison. The great news about the production of the TS808HW is that what you hear from one of these pedals should be pretty consistent with other TS808HW units. Sure, they’re all individually hand-wired, but Ibanez has gone to great lengths to set a new high standard for Tube Screamer tone. 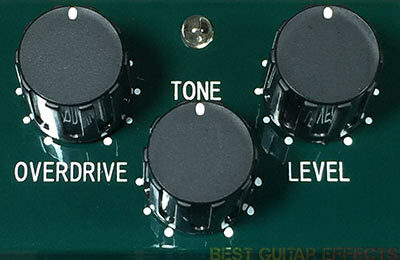 Ibanez says that this is the “most evolved Tube Screamer ever created”. My impressions are that the TS808HW is indeed the most exceptionally well crafted Tube Screamer that Ibanez has produced. The tones in this pedal easily sit alongside the greatest Tube Screamer tones you’ve ever heard. So how exactly does it sound? Well, there are certain characteristics Tube Screamers are known for, particularly their accented mid-range boost. There’s also an enhanced touch sensitivity that makes a good Tube Screamer a sheer joy to play through. The overdrive tones produced from that classic JRC4558D chip are just as important, hence the reason you always see that chip specifically referenced. The TS808HW exhibits all the qualities you’d expect from a Tube Screamer but with a certain uniqueness that earns this pedal its own coveted place in the Tube Screamer legacy. While some Tube Screamers can sound a little harsh on the top-end or a bit light on the lows, I find the TS808HW be more gentle on the highs and has extra low-end presence. While the mid-range hump is also still ever present, there’s a little mojo happening across the whole frequency spectrum that sets the TS808HW apart from lesser 808-inspired pedals. I wouldn’t quite say that it’s coloring your tone any more than a Tube Screamer is known to do, but it’s more-so that the pedal is preserving more of the inherent tone that you’re feeding into the pedal from you guitar. Between the high quality components and Japanese MOGAMI OFC cable that it’s wired with, the TS808HW minimizes the negative tone-sucking effects of pedals perhaps more than most overdrive pedals on the market. For the impact that cheap wiring can have on tone, this pedal may also have a positive impact on your sound even when bypassed compared to other pedals that use lower quality wiring. The TS808HW has a “hi-fi” sound quality with much greater depth than your run of the mill overdrive pedal. Some people believe that a good Tube Screamer can make just about any amp sound better. There’s a certain truth to that just in how our ears respond more pleasingly to mid-range frequencies which Tube Screamers are known to accent and enhance. The TS808HW delivers a pleasing nudge to your amp’s preamp that can help you find any amp’s sweet spot. When playing the TS808HW into a clean channel, you can dial in higher Overdrive settings to instantly achieve mild to moderate crunch tones. The Tone knob remains surprisingly musical throughout its range and can help you contour the sound to your tonal preferences. The Level control can provide a reasonably substantial boost for a hefty volume increase for solos or kick to your amp to induce some extra saturation. 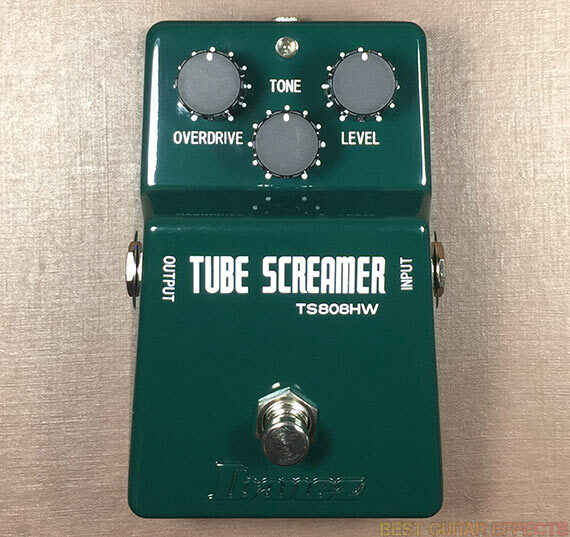 (Where do you think the “Tube Screamer” name comes from?) If you’re playing the TS808HW into a crunchy or heavily distorted amp channel, cut back the Overdrive to use the Tube Screamer for some added dynamics to your pick attack and just a little extra cut and aggression to your sound. As countless guitarists know, a tastefully used Tube Screamer in front of a dirty amp can make a good overdrive foundation sound even better. The TS808HW handles this task exceptionally well. Also, as far as getting into the territory of those classic Stevie Ray Vaughan tones, this pedal will get you closer to that ballpark than nearly anything else. Yet while the TS808HW would be my first recommendation for a modern guitar player seeking out those classic tones, this pedal offers even greater opportunity for finding your own signature sound. Each hand-wired Tube Screamer it as unique as your playing is, so make it your own. While I sometimes find myself reluctant to give out the highest ratings to simple pedals with seemingly few applications, the TS808HW is just hard to not like. While another recent Ibanez offering, the visually and sonically appealing ES2 Echo Shifter, features great looks and sounds but is mass-produced in China, there’s something about the overall sound and ‘feel’ of the TS808HW that comes with the attention to detail of being a hand-made product. There was one minor thing I almost wanted to gripe about: Ibanez stuck with an old-school 1/8” (3.5mm) power plug socket. Fortunately, they include a small adapter cable that’s compatible with standard modern power supplies. Just don’t lose it! And it kind of adds to the retro-meets-modern vibe of the product. 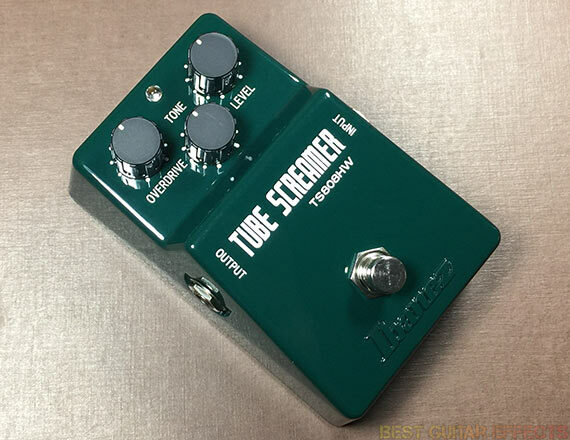 With reissues of the TS-808 still going strong (along with the new TSMINI), the Tube Screamer guitar pedals have long been a mainstay for great overdrive tones. The TS808HW is simply impeccable and sets a new modern overdrive standard. Let’s see the final result. The Ibanez TS808HW Hand-Wired Tube Screamer is the ultimate modern version of the iconic Tube Screamer design available from Ibanez. While capturing the classic sound that the best Tube Screamers are known for, the TS808HW has its own unique feel that sets it apart from other Tube Screamers and similar styles of overdrive pedals. While keeping everything that made the original TS-808s endure over time, the TS808HW carries that legacy forward for new generations of guitarists to experience and make their own. That concludes our Ibanez TS808HW Hand-Wired Tube Screamer review. Thanks for reading. Want to buy the Ibanez TS808HW? Does this have the same power plug as a regular TS-808, or did they finally change it so we don’t need the special adapter?